A former Chairman of the Joint Chiefs, General John M. Shalikashvili, announced this week he has reviewed new evidence and changed his mind on the disputatious subject of gays in the military. I applaud the general, for it is the mark of a great leader to be open to change when given new information and time. The following historical story about decisions that were made regarding another military minority is offered in the interest of throwing light on gays in the military policy questions of the day. In 1970, military planners faced the challenge of how to recruit and maintain the highest quality of personnel as the All Volunteer Force loomed on the horizon. One primary untapped recruiting source kept recurring as a partial solution — women! After WWII the Congress had legislated that women be no more than 2% of the total military force. Nonetheless, having considered “the women option” fully, these military personnel planners recommended that quotas and career opportunities for women be dramatically changed. Gradually discriminatory laws and regulations were lifted and today women are 15-17% of the total force and enjoy wide ranging career opportunities, including sea duty and flying status. Military planners today confront a similar personnel reality to that of the early 1970s; their superiors are asking for analysis of all options to increase troop strength. If logic prevails, one of the primary choices to be selected — without either degrading quality or considerable expenditure for increased benefits — involves yet another minority group, gays and lesbians. Unlike the social climate regarding military women thirty five years ago, polling data supports changing policies toward military gays. According to a new Zogby International poll of 545 U.S. troops who served in Iraq and Afghanistan, three-quarters of the troops say they are personally comfortable interacting with gays with only 5% saying they are “very” uncomfortable. Other polls affirm that both military members and the general public are ready for a change in policy toward gays. With the overall military’s attitudes against them, Pentagon planners in the 1970s took bold steps to manage troop level issues caused by creation of the All Volunteer Force. It was military leaders, by the way, and not congressional leaders who launched the initiatives on creating equal opportunities for military women. I ask today’s Pentagon planners — just as General Shalikashvili has done — to connect the dots between dropping a discriminatory policy and satisfying an urgent need for increased troop levels without lowering standards. We did it for military women and have seen a far stronger force because of those measured, tough personnel decisions so many years ago. 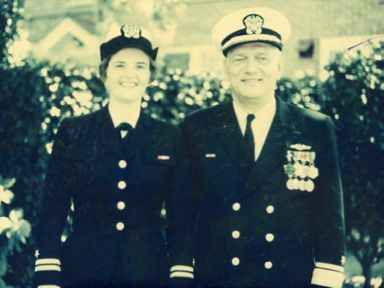 Commander Coye, a former commanding officer, is a graduate of Wellesley College, the American University School of International Service and the School of Naval Warfare (Naval War College). She taught Political Science at the Naval War College and several undergraduate colleges. An Advisory Board member of the Military Equality Alliance and Emeritus Board member of Servicemembers Legal Defense Network, she resides in Ashland, Oregon. (2) The number of 42,000 additional gay men would be if the proportion of gay military men were the same as in the general population (conservatively at 4%). More backup data is available if needed. (3) Para . 2 above: Naval War College Review,Jan-Feb 1973, “Is There Room for Women in Navy Management, An Attitudinal Survey”, pp. 69-87.
incl. shipping and handling and autographing.